Vanarama-sponsored Hemel Storm are poised to strengthen their line-up ahead of the January 31st signing deadline and battle for a place in the prestigious end-of-season National Championship Play-offs. Hemel Chairman Tony Humphrey revealed the Club’s strategy this week which he said included “a major and hugely exciting new signing” to help boost the team’s chances against sides with imported foreign talent. “Our Coaches are in the process of making roster changes too and our new-look team is challenged with the single target of reaching the Play-Offs,” said the Chairman. The Club has fourteen National League Division One games left and are currently in thirteenth place in the table in one of the two relegation spots immediately above basement side Manchester Magic. Storm’s 3 and 9 League record this season includes five losses by an average of three points per game and includes an 80 – 83 loss last November to Team Newcastle who are the visitors to Hemel Leisure Centre this Saturday. “Obviously those close losses have really hurt our League placing,” said Hemel Head Coach Robert Youngblood, “but we’ve analysed each of them and have been making slight technical changes this week on top of the work that’s gone into strengthening the squad. Team Newcastle come to Hemel on Saturday sitting in eleventh place in the table with a 5 and 9 record. “They’re a dangerous team,” said Associate Head Coach Dave Titmuss who watched them in Derby on Saturday. “Since we lost to them earlier in the year they now include 6’ 7” Croatian brothers Nikola and Fran Urli in their line-up, they also have two impressive Americans and one of the best young players in the country in Tosan Evbuomwan who had 28 points against us last time. They’re a well-drilled and efficient team. And the Chairman added this appeal to the Storm faithful: “More than ever we need you and your noise at each of the remaining seven home games. We need the ‘Storm Dome’ packed. Please pencil in our remaining fixtures and don’t forget the rearranged match against Reading Rockets which is now on Sunday March 17th at 5pm. “We want to continue to bring top-class basketball to our community so we have to maximise our finances. The Club is run by volunteers and every penny we raise goes into promoting the games. Just buying a match night raffle ticket or programme or some Storm merchandise makes a huge difference,” said Mr Humphrey. And he added: “I’d like to thank each and every one of our incredible sponsors too and their business owners. We couldn’t do this without you. “Let’s enjoy the next nine weeks – let’s go Storm”! Hemel are in their seventh season in the NBL’s top flight and have qualified for the end of season Play-offs five times twice finishing in the top four, and last season bringing the National Cup home to the town. While in Division Two they twice won the National Patrons Cup open to teams outside of Division One. 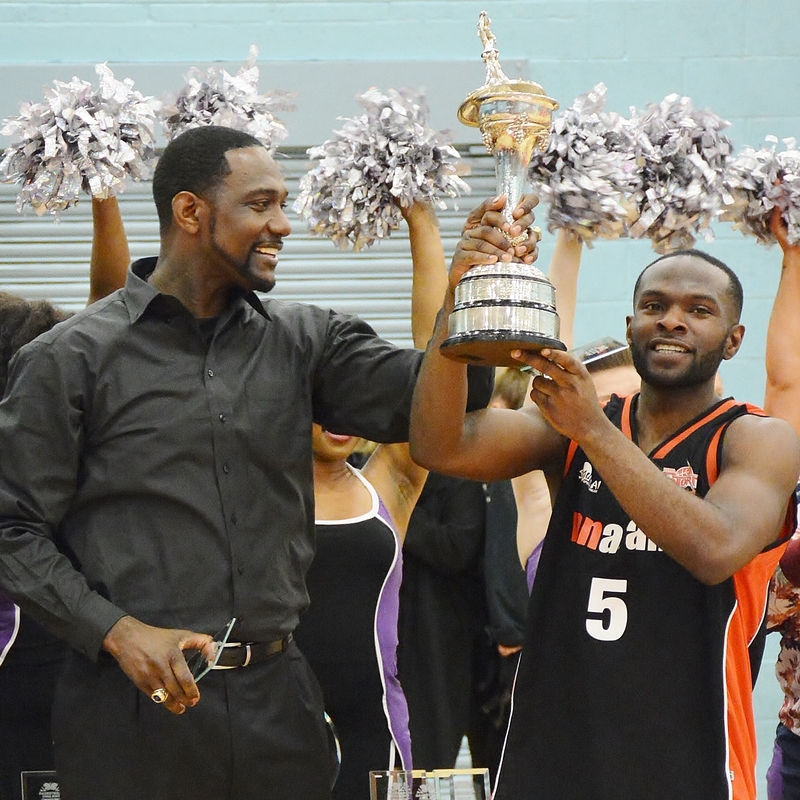 Photo caption: Storm’s Head Coach Robert Youngblood and captain Bode Adeluola with the National Cup won last season.